When the Beatles performed on the Ed Sullivan Show on 9 February 1964, there was noise from screaming fans. During this performance, John, Paul, George, and Ringo had difficulty hearing each other. However, they delivered a great performance. How did they coordinate their musical efforts? Individually, John, Paul, George, and Ringo were proficient musicians. They invested years developing their musical abilities. As a group, the Beatles practiced together for years. They performed under a diverse set of conditions. They had experience in ideal performance conditions and challenging performance conditions. Musically, they knew what to expect. They pre-selected songs for the performance that they had mastered. The arrangements were designed for live performance by four musicians. These arrangements were familiar. They did not rely on a technology that they could not control. They did not have a sophisticated audio monitoring system. They did not have headphones or in-ear personal audio monitors. They did not rely on delayed feedback from others involved in the production. In part, the quality of the musical performance required using information accumulated in the past to influence the future. This can be called a feed forward approach. A feed forward approach benefits from the involvement of proficient practitioners. In a feed forward approach, training precedes performance. In other contexts, a feed forward approach may be characterized by a control signal that is transmitted from a source to a destination. During the performances in 1964, the crowd noise was a prominent signal. During the performances, there were valuable subtle signals. The subtle signals provided feedback during the performances. Feedback is an approach that uses information about current results to influence operation in the present. Feedback modifies a system based on interim results. Feedback changes the system output. This approach may be referred to as closed-loop feedback. Valuable subtle signals may not be available when they would be the most useful. Valuable subtle signals may be overlooked by novices. An individual musician may not have the capacity to discern valuable subtle signals from the spurious subtle signals. Stated another way, an individual may not know that a subtle signal is valuable when they detect it. The value of amplifying a particular signal by a specific amount is assessed by the nature of the results and the interaction with the environment. Incorporating the appropriate subtle signals enabled the Beatles to be proficient performers in environments with nearly overwhelming undesirable noise. It was so noisy in the Ed Sullivan Theater during the Beatles’ performances that the camera operators could not hear the instructions from the program director. The camera operators were proficient individually. They formed a cohesive team. They framed every shot without being able to hear the coordinating instructions from the director. The next week, a decision was made to replace the open-ear headphones with over-the-ear headphones. 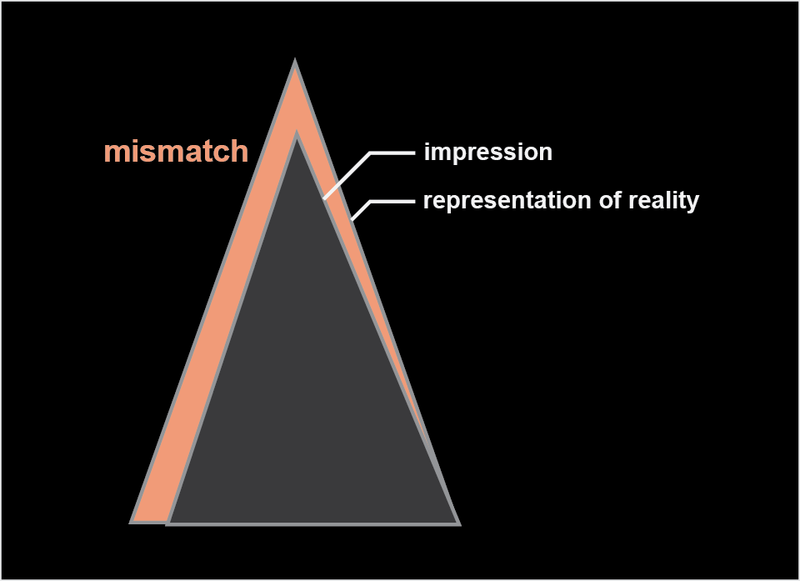 A 2-dimensional model of impression, representation of reality, and reality. Impressions flow from previous experience which includes knowledge, skills, training, and capabilities. Practice and theory shape impressions. Impressions establish the boundaries of the decisions that can be made and the actions that are possible. Words that can be substituted for impressions may include hypothesis and model. Impressions may be faulty or incomplete. Impressions are built on assumptions. Biases influence impressions. Individual observations may be misleading. Errors may be unknown. Representations of reality may be faulty or incomplete. Approaches should be developed to detect and correct mismatches. A properly developed approach enables impressions and representations of reality to be addressed and improved. The mismatch approach summarized in this post is based on the insights of John Boyd. Some of his insights are encoded in his OODA (for Observation, Orientation, Decision, and Action) Loop sketch (Boyd, The Essence of Winning and Losing, 1995). Although the word “mismatch” is not one of the labeled items, the concept is encapsulated in the sketch and described in Boyd’s Conceptual Spiral briefing of 1992. In situations that rely on a coordination of efforts, the potential for success is improved with rapid feedback and feed forward capabilities. An approach that has been developed to detect and correct mismatches can provide a way to make corrections dynamically. It provides a framework to ensure that mistakes aren’t propagated. Proficient craftsman can incorporate selected subtle signals appropriately to achieve valuable results nearly instantaneously. A mismatch approach can be used in situations that include preparation, performance, and retrospective phases. In these situations, there may be long delays between analysis, plans, actions, and consequences. In these types of situations, feedback is delayed and it is more difficult to perceive relationships between cause and effect. Prominent signals, subtle signals, and noise plus their interactions contribute to mismatches. Mismatches are multidimensional. John, Paul, George, and Ringo continuously synchronized their efforts. Subtle signals helped Paul McCartney and the other Beatles coordinate their musical efforts during performances on the Ed Sullivan Show under conditions of extreme noise in 1964. An appropriate analysis will suggest additional investment opportunity areas such as theory and practice. You will have insights to discern the valuable subtle signals from the spurious. Strive to improve your agility so that you can learn faster than the speed of the market and faster than competitors. Analogous concepts can be applied to improve Development Experience [DX] in new product development. The concept of prominent and subtle signals is not the same as weak and strong signals as described in the February 2014 McKinsey & Company article, “The strength of ‘weak signals:’ Snippets of information, often hidden in social-media streams,” offer companies a valuable new tool for staying ahead. In that article, weak signals refer to beliefs of a small population of elite users that may be thought to have a better than average capability to predict trends in the future. Subtle signals can be used to impact the present. This entry was posted in Developing Winners, Development Experience, New Product Development and tagged Boyd, Development Experience, feed forward, feedback, impressions, John Boyd, mismatch, mismatches, New Product Development, OODA, OODA Loop, prominent signals, representations of reality, requisites to coordination, subtle signals by OpLaunch. Bookmark the permalink.